This work studied the feasibility of potassium carbonate-glycerol deep eutectic solvent (K2CO3-Gly DES) as a potential green solvent applied in lignocellulose pulping. 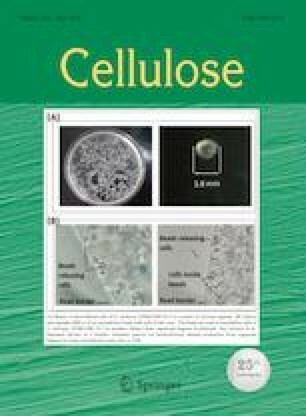 Cellulose fibers were extracted from rice straw via novel alkaline DES pulping technique using 1:7 molar ratio of K2CO3-Gly DES. Optimum pulping parameters were determined using the one-factor-at-a-time (OFAT) method. The cellulose fibers were characterized for chemical composition of cellulose, hemicellulose, lignin and extractives. Changes in physical structure, chemical structure, morphological structure, functional groups and crystallinity index (CrI) were investigated using Fourier transform infrared spectroscopy (FTIR), X-ray diffraction (XRD) and scanning electron microscopy (SEM). The results revealed that the optimum pulping temperature at 140 °C, reaction time of 100 min and 1:10 rice straw to DES mass ratio produced the highest cellulose content of 73.8% for unbleached DES treated pulp. Chemical composition analysis and FTIR verified that this alkaline DES pulping method was able to achieve partial removal of hemicellulose and lignin from lignocellulosic matrix. Moreover, XRD result demonstrated that the CrI of cellulose fiber increased from 52.8 to 60.0% after pretreatment. The cellulose fibers had diameters ranging from 3.58 to 5.68 µm. This study proved that the specifically-designed K2CO3-Gly DES could successfully isolate cellulose from lignocellulosic biomass through alkaline DES pulping. The authors would like to thank the School of Bioprocess Engineering, Universiti Malaysia Perlis (UniMAP) for their support in this research. The authors declare no conflict of interest in the publication.